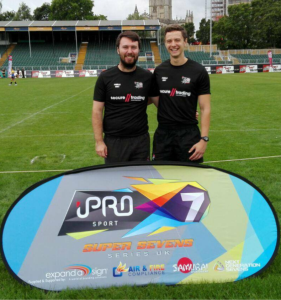 In 2018 Somerset Rugby Referees’ Society set up a 7s Squad to supply the growing sport of Rugby 7s across the county and beyond. The squad was set up to improve the standard of refereeing across all levels of the 7s game. The squad is open to all members of the society as roles include being an assistant referee, coaching other members of the squad or being a pitch manager. Members of the squad are able to referee at as many or as little tournaments as they would like by making themselves available on a tournament by tournament basis, via Who’s The Ref. Between May and August is the busy period when the squad is most active. Outside this period, there are many school tournaments starting in January before the schools make their journey to Rosslyn Park 7s, the largest school tournament in the UK. The squad has some great links with some local tournaments including two tournaments which are part of the national Secure Trading 24/7s tournament, these being Frome 7s & West Country 7s. In 2017, one member even refereed at the regional qualifiers in Exeter as well as 2 members taking part in the Super Series Finals in Bath as assistant referees. The Society 7s squad has links with other societies to help each other out when they are in need of more referees to supply to tournaments. The link allows members to referee as much or as little as they want. At the start of 2019 the squad are looking for sponsors to improve the look of a great squad. If this sounds like something you would like to be part of then please contact me on harry_garmey1993@hotmail.co.uk.